This review of Nitrocut is aimed at helping the customers in making the best decision when it comes to buying health supplements. There are a lot of health supplements out there but to choose the best becomes tough and this review will help the customers in buying a product that suits their requirements. Nitrocut is an effective nitric oxide muscle builder and is for those looking to put on a lot of muscle as fast as possible. The product is available on its website as well as on other shopping websites. Read on to know more about the ingredients that are used in this supplement and whether this suits one’s needs. Each bottle of Nitrocut contains 120 capsules which at 4 capsules per serving is a 30-day supply. Nitrocut has no known adverse side effects when used as directed by healthy individuals. If one is taking prescription medicine or drugs or have any severe health problems, it’s always recommended to consult with a physician before taking this supplement. The product is offered in several options. 1 Month Supply for $54.99 which is 1 bottle of Nitrocut. One Month Supply $10.99 shipping for international orders. 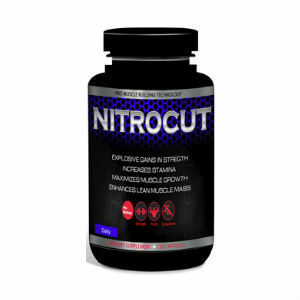 3 Month Supply for $111.00 which is 3 bottles of Nitrocut – Breaks down to $37.00 per bottle. Three Month Supply $18.99 shipping for international orders. 6 Month Supply for $199.99 which is 6 bottles of Nitrocut – Breaks down to $35.00 per bottle. Six Month Supply $30.99 shipping for international orders. The manufacturers offer a 60 days money-back guarantee if one is not satisfied with the product. If one has purchased either 3 Month Supply or 6 Month Supply, then only 1 bottle out of the total order may be opened or used—all other bottles must be returned unopened and unused for a full refund. If more than one bottle is opened and returned within the 60 days period then a $19.95 restocking fee will be applied for each open bottle returned. The customer reviews are very good and encouraging. They help the prospective customer in understanding how it works for different types of bodies. Nitrocut as a health supplement comes across as a good option for people who are looking for healthy supplements for muscle building. The ingredients and all the queries are answered properly on the website and in detail. There is a money back policy as well and the customer reviews vouch for the safety of the product. However one must take advice from a doctor before ordering such supplements to be on the safer side as there can be adverse effects on the health of a consumer. It can clash with other medicines, if one is taking them, and therefore is advisable to consult a doctor before taking the supplement. The ingredients used in this supplement are natural but can cause different reactions in different individuals depending on their body constitution and age. The bottom line is that one should be careful when it comes to using such products.